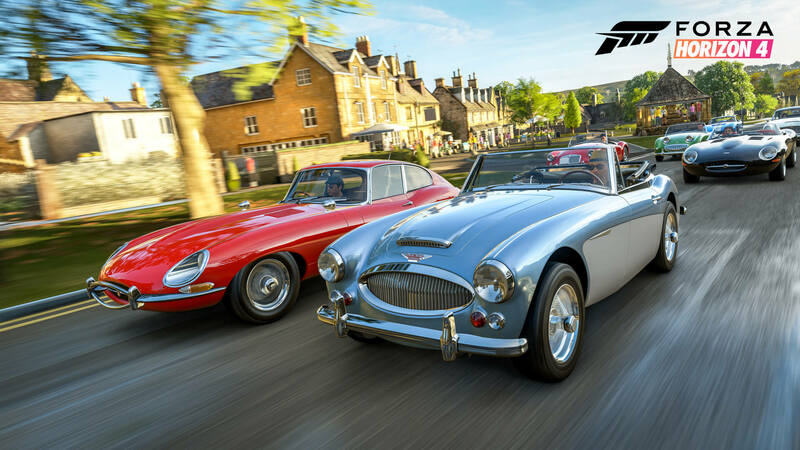 Seasons is the headlining feature in Forza Horizon 4, and they change everything in beautiful, historic Britain. Players are required to master driving in dry, wet, muddy, snowy and icy conditions. 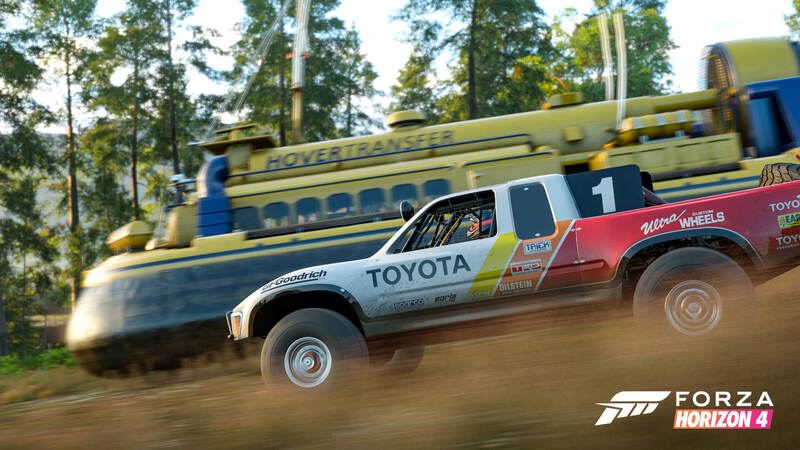 Seasons will constantly evolve Forza Horizon 4’s open-world on a weekly basis, and with more than 450 Forzavista cars to collect, race and customize, there’s plenty of unique driving experiences to be had in Playground’s next installment to their acclaimed open-world racing series. 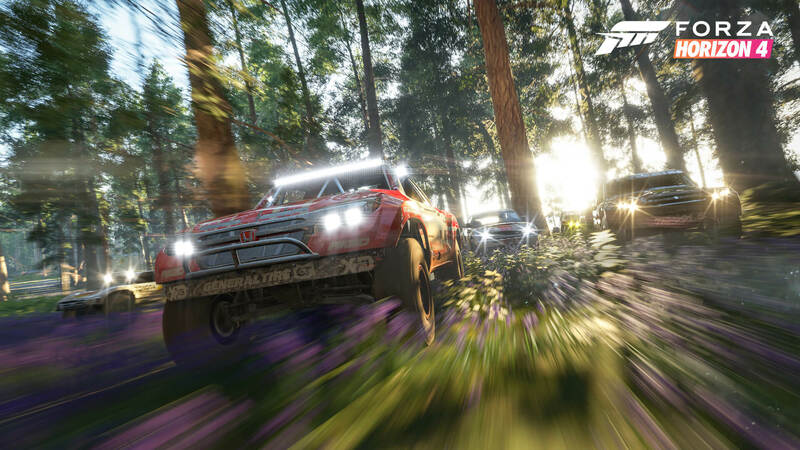 In a new blog post shared on the Xbox Wire, Microsoft’s Will Tuttle caught up with Forza Horizon 4 Design Director Jon Knoles to discuss the best tips and tricks for tackling each season in the game, and what to expect when they change every week. With a deep upgrade system that allows you to optimize any car for any season, it’s important that players think about their choice of vehicle for each weather condition and whether they need to adjust their suspension, as well as how you need to change your driving style depending on the terrain. Obviously, seasons will have a distinct look and flavour to them, dishing out different weather conditions and scenarios depending on the time of year. Some roads and forests in Winter will be covered in snow and ice, but other areas of the country will have it all ploughed away with only a trail of white dust left behind. Autumn will add a reddish look to the landscape as trees begin to lose their leaves whilst Spring makes the world feel fresh and alive before it matures in Summer. Below, we’ll have a look at the tips shared by Knoles for all four seasons in Forza Horizon 4. Summer is the perfect time of year for putting your foot down on the pedal and speeding through Britain’s fastest motorways or ripping along the golden sands of the northern coast past the brooding Bamburgh Castle. Whilst most of the time you’ll find dry weather with a high, mid-day booming sun, you may encounter the occasional summer rain-shower. Trees will also have fully matured as the sheep become woolly and ready to be sheared. Those who take a shortcut through fields will be easily able to plough through tall grasses and flowers. You also don’t have to worry about wood, wire fences, small trees or stacked drystone walls. No matter what you’re driving, you’ll be able to break through these without smashing up your car – providing you’re going fast enough, obviously. Smaller, lighter cars will naturally slow down when going through these obstacles, whilst larger, heavier vehicles will plough through them with ease. As with all seasons in Forza Horizon 4, there will be array of seasonal gameplay events, challenges and rewards that are exclusive to Summer and expire at the end of the season. These events will take full advantage of the perfect driving conditions to feature the game’s fastest cars on the best driving roads to be found in historic Britain. 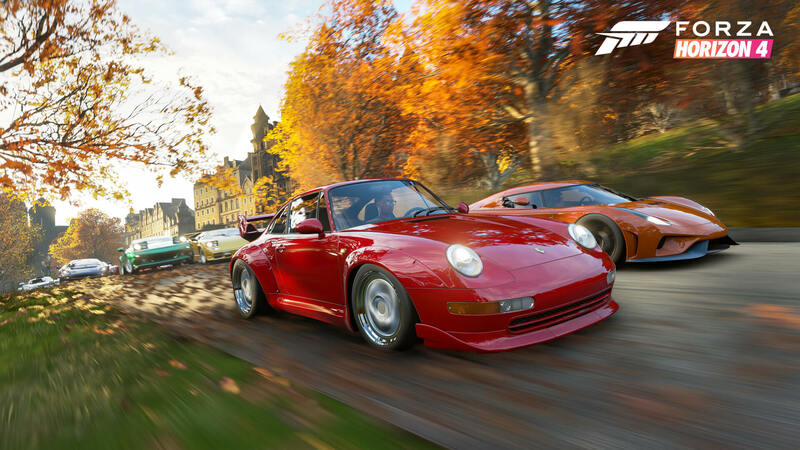 Autumn could very well be the most beautiful season to traverse Britain in when playing Forza Horizon 4. It’s arguably with most colourful with its reds, oranges and yellows, and you’ll see these colours dominant the screen as you drive across the tree-lined, winding roads of the British Lake Country. Perhaps you’ll head off-road all together and tackle the Mudkicker’s Adventure Park in your favourite 4x4 rally machine. It’s also after the harvest, so the fields that were fill of tall grasses in Summer have been ploughed and are full of soft, muddy earth that will slow you down a little bit. They’re also peppered with new obstacles in the form of big, heavy bales of hay. No matter how large or fast your vehicle is, these were certainly slow you down if you crash straight into them! There’s also more rainfall in Autumn than Summer, and the roads do become ever so slicker in wet weather, so you’ll want to plan a little earlier for those hard turns. All seasons in Forza Horizon 4 offers its own classic, seasonal Barn Find to discover and restore that’s exclusive to that time of year, and Autumn is no exception to the rule. If you want to add this historic ride to your collection, you’ll need to find it before the season transitions again. Winter is by far the most distinct and unique season in Forza Horizon 4. Not only is it covered in snow and ice, but a low sun shimmering through bare trees across the frosty landscape will vastly change the overall visual outlook of this season. That doesn’t mean it isn’t fit for driving, however, as Forza Horizon 4’s tires are good for all seasons and will be enough to keep you on the road, providing you brake on time and turn for those sweeping curves. If you want more grip on the snow and ice, you can equip your car with studded winter tires in the upgrade shop, and any car that was already equipped with off-road or rally tires will automatically switch to studded tires. It’s smart, but it works – seamlessly. The weather throughout Winter time can range from clear to light flurries, or even the occasional blizzard. With higher elevations towards the north of the map, you can expect more deep snow than lowland areas in the south of Britain. Coastal beaches are still sandy, and motorways, the city streets of historic Edinburgh, and other major roads are cleared of ice and snow. 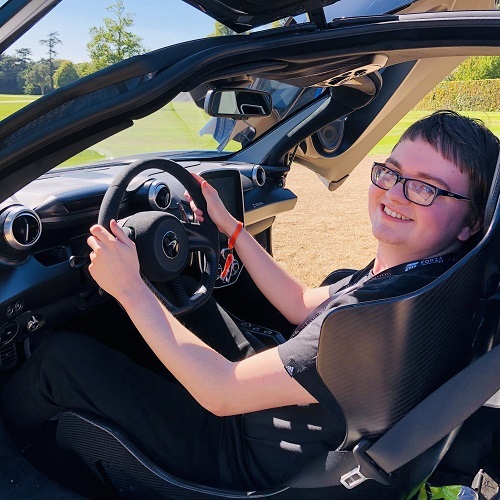 This means you can still take out your McLaren Senna or Ford GT and speed across the sweeping roads of Britain and its snow-covered surroundings without constantly spinning out or crashing. Furthermore, Winter allows you to reach previously inaccessible areas to search for bonus boards to smash into – now referred to as Influence Boards within the game, or to hunt down one of the many Barn Finds in Forza Horizon 4, such as on an island in the middle of a deep lake. When you’re on the frozen lake, it doesn’t matter what you’re driving or what kind of tires you have, you will slide around a lot, which itself is a lot of fun. You’ll also want to keep an eye out for snowmen, too. Smashing into them is fun – well, for you, obviously, not the kids that built them. It will also add to your combo skill chain. Winter will naturally be full of seasonal events that test your skills out on the slippery ice and snow it provides, but rest assured, as there’s still plenty of clear roads to drive on throughout this festive time of year. 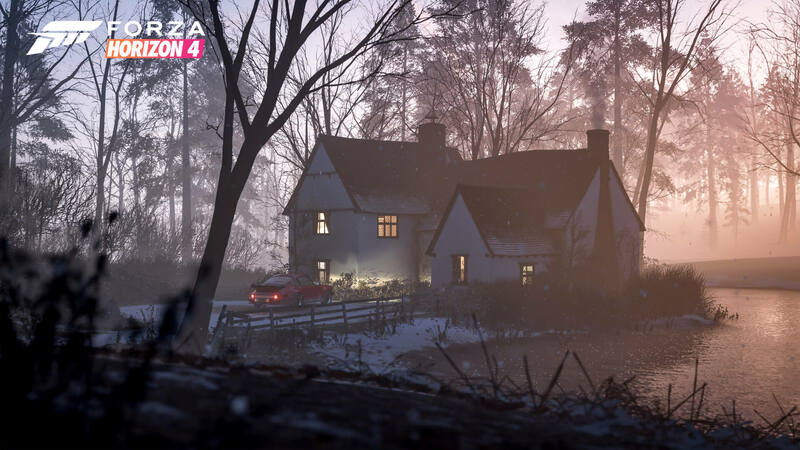 Spring welcomes a freshness to Forza Horizon 4’s Britain with an overall crispness to the landscape as trees, flowers and shrubberies begin to sprout. The landscape itself bursts to life in vibrant colour, and you can expect a lot more rain with plenty of sunshine to accompany. There’s also lambs around the fields before they mature into sheep, and there’s even chickens to be found, too. Soundscapes also change in each season, including ambient noises around the environment, as well as different birdsongs that are associated to different regions in Britain. Spring is one of the more varied seasons in Forza Horizon 4. Riverbeds that were previously dry or shallow become deep, rushing streams. These may slowdown supercars and lightweight vehicles, but they don’t pose a threat to the likes of an SUV, an off-road trophy truck or buggy. If you so happen to miss the snow-covered landscapes of Winter, then you can climb to a mountain peak within the Scottish Highlands at the north of the map to find pockets of snow to play around in. Like Autumn, you’ll find a more rally-heavy theme when it comes to seasonal events in Spring with mixed-surface races to suit the varied conditions. Whether you’re driving a sturdy Subaru WRX STi or a classic Group B rally monster from the 80s, you’ll be sure to discover some trail-blazing events in cars built to tackle all the tarmac, gravel, and mud that you’ll get plenty of in Spring. It’s only fitting for this time of year. 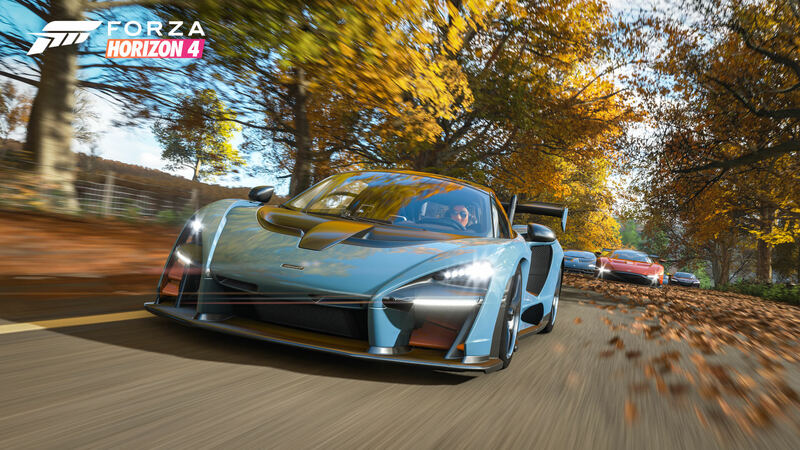 As a reminder, seasons will change on a weekly basis in Forza Horizon 4 – and all players will experience the same seasonal conditions with the switchover occurring for everyone at the same time. However, you can race in your favourite seasons whenever you desire by making your own custom race events with the Horizon Blueprint feature. This allows you to select the season and weather conditions that suit your race the most. If you fancy escaping the snow-covered landscapes of Britain in Winter, then this might be a good alternative to try out! Forza Horizon 4 launches worldwide on October 2nd, 2018 for Xbox One and Windows 10 PC. It’ll be available day-in-date on Microsoft’s Xbox Game Pass subscription service. Those who pre-order the Ultimate Edition can start playing four days early. 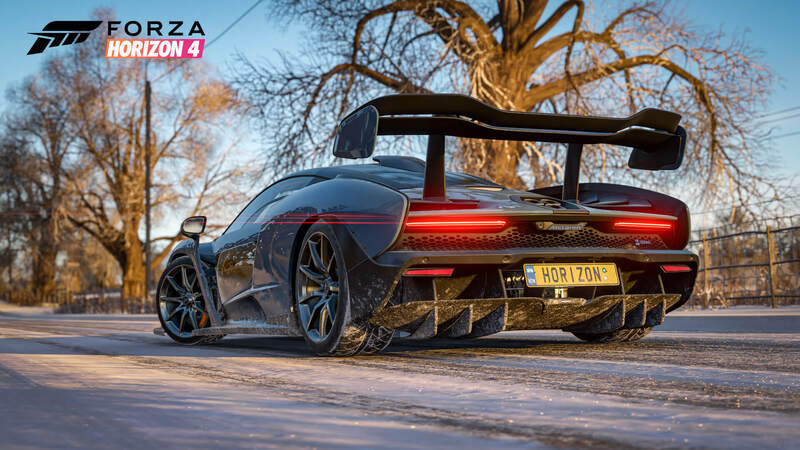 Expect more from Playground’s latest open-world racing game leading up to its release, but for everything you need to know about Forza Horizon 4, be sure to read our hands-on preview of the E3 demo, where we had the chance to test drive all four seasons within 10 minutes. Additionally, you can can also find our in-depth recaps of the official Summer, Autumn, Winter, and Spring livestreams from Playground Games, which dived deep into the new features available in Forza Horizon 4. These covered various aspects of the game and revealed a ton of new gameplay footage, which naturally highlighted each of the four seasons available within the game – so be sure to check them out!